This is genius. Finally, we are seeing inking innovations come to live on actual execution. So, I have come across several products attempting to use such reactive paints that changes or unveils depending on its environment and I must say, such inventions to make things pretty has little or no relevance at all. This Heineken beer can’s hidden design not only extrudes beauty, it also has a reason for doing so. 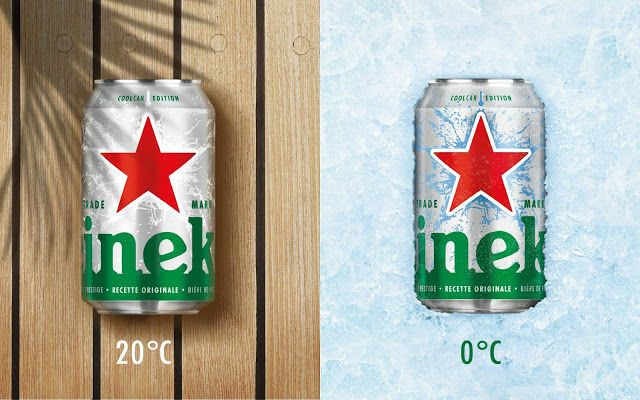 While the can illustrates a big iconic red star in the middle, the white lines around the icon actually unveils blue splashy vines of water designs when the can reaches a freezing temperature. What a wonderful idea that not only makes a it a joy to look at but also a valid reason for design. Created by Raison Pure, these designs are awesome.